HURRAY! THANK YOU JESUS! ALL ROADS LEAD TO TBS LAGOS TODAY 7PM. SOMETHING AWESOME BEYOND YOUR BRAIN IS ABOUT TO HAPPEN. BE THERE AND FORWARD THIS TO YOUR SOCIAL MEDIA CONTACTS. THIS IS YOUR DAY! THIS IS YOUR YEAR IN JESUS NAME! Amen. Next Post:Our Daily Manna 27 January 2019 By Bishop Chris – THE STRANGE DOCTOR! Please, how do I get to view it? Please, can someone help me get access to watch live Broadcast from TBS tonight? Have been trying but to no avail. 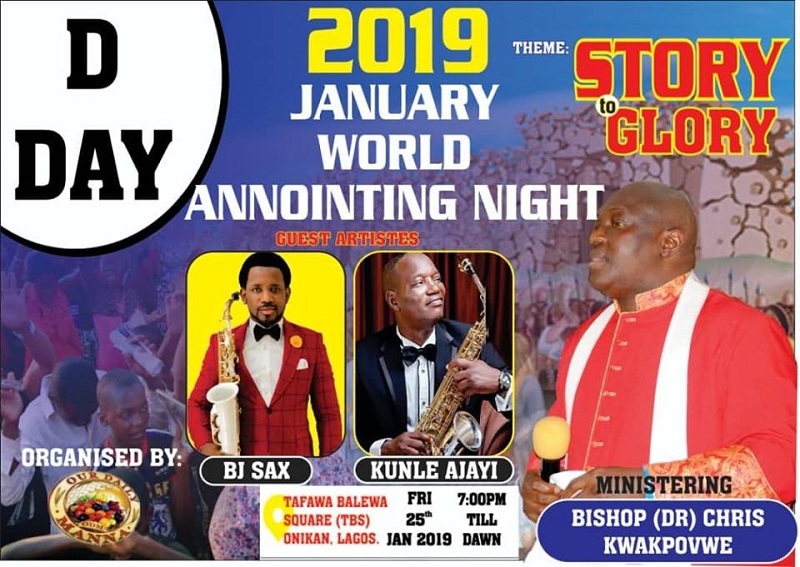 Please can some help me; I have been trying to connect to live broadcast from Lagos for the 2019 World Anointing Night! I am on standby please. Same here pls still waiting, for live broadcast, any info? Elizabeth. Been trying to connect to TBS live broadcast to no avail. I need help please. Awesome night! Even if physically we weren’t there…spiritually we were there! ! GLORY hallelujah! ! !